Humanitarian mom and movie star Angelina Jolie has yet to endorse a candidate for president in this historic race, but has finally given kudos to Sen. Barack Obama in the German edition of Vanity Fair. While she says his mixed background is "good," Jolie says "it's not a sufficient reason to vote for him." But where he stands on the issues makes him a tempting choice. "Obama fights for international justice, he wants to militarily intervene in cases of genocide, and close Guantanamo Bay," the Changeling star says. "These are the things that could move me to vote for him, not his roots." 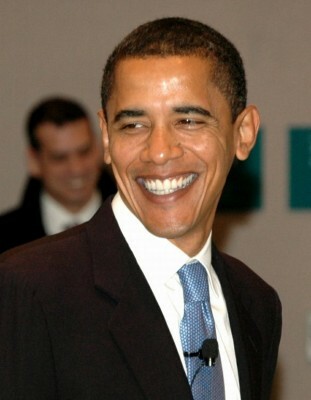 But in terms of his roots: "Naturally, an American president like Barack Obama would be nice for my family." 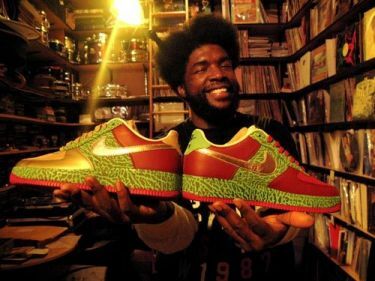 Only days after fans lined up for a full weekend to get the exclusive NIKEs designed by Ahmir "?uestlove" Thompson, drummer and musical director for the Roots, the shoes have caused pandemonium on the web. The $225 red, green and gold Air Force 1 sneakers--dubbed Air Questo--which are part of NIKE's 1World collection that will feature 18 designs over the next year and a half, have hit Ebay. Bids range from $500 to $4000! A few dozen "hidden" pairs will have a gold toe (instead of red), NIKE spokeswoman Demetria White said, causing more sneakerheads to freak. The shoes were officially released on Friday in New York.